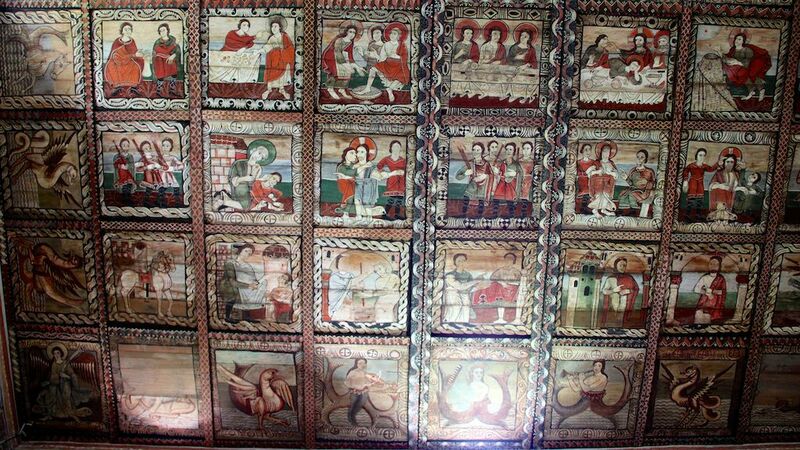 The Romanesque painted wooden ceilings in the St Martin’s Church in Zillis, canton Graubünden in Switzerland, is one of very few to have been preserved in Europe. 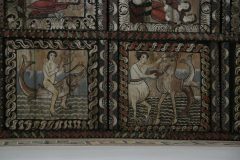 The early 12th-century ceiling consists of 153 painted wooden squares with mythical images, Biblical scenes and episodes from the life of St Martin of Tours. Zillis is at the Via Mala in the Rhine Valley en route to the San Bernardino pass and easily reached by car or public transportation (postal bus). From the outside, the early 12th-century church of St Martin in Zillis looks bog standard for a Romanesque hall church built in colder climates. It is a solid rectangular block with a few small windows placed high up on the walls of the nave. A Gothic choir was stuck on at the east end at some stage; the clock and the roof of the Romanesque tower are clearly newer too. 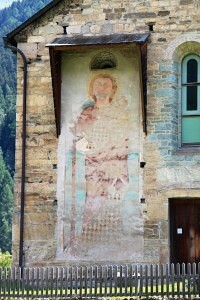 Even a giant St Christopher painted around 1320 on the western façade fails to really excite modern passersby. Inside, the church has whitewashed walls and the sixteenth-century Gothic vaulting of the choir is not particularly exciting either. The pews and organ are modern. However, look up and the magic is revealed. 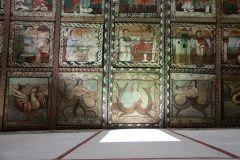 St Martin’s in Zillis has only one attraction but it is a good one: a magnificently preserved Romanesque painted wooden ceiling. It has been restored but was never over painted. Similar examples can only be seen in the Michaeliskirche in Hildesheim in Germany and Dädesjö in Sweden. 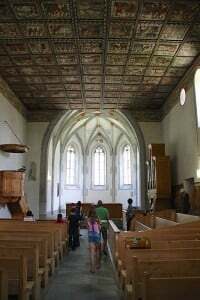 The painted wooden ceiling was installed around 1110 in the St Martinkirche in Zillis in the Hinterrhein Valley in Graubünden. It consists of 153 square wooden panels of around 90 cm each placed in 17 rows of 9 panels. The scenes cover a surprisingly wide range of themes: mythical figures, biblical events, and the life of St Martin of Tours – the patron saint of the church and village. The paintings reflect not only the worldview of the eleventh-century European but also Zillis’ place in the world. Also note the patterns framing the individual panels. Further wood strips, which forms part of the fixing structures, allow a visual divide between the domain of evil and good. A large Christian cross is formed by these patterns with the devil trying to tempt Christ with all the riches in the world at the crossing. 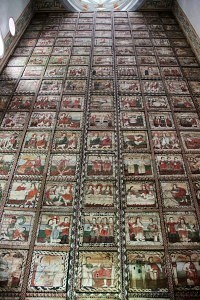 The 48 paintings forming the outer ring of the ceiling are mostly painted with mythical figures. These symbolize evil with many combining the features of land and see animals, or animals and humans, in single outlandish figures. In the four corners are angels symbolizing the four wind directions. They also warn churchgoers of the apocalypse and the last judgment – a sort of medieval the-end-is-neigh warning. 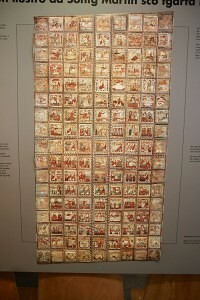 The inner 105 panels are of biblical scenes and the life of Martin of Tours. Scenes include ancestors of Christ such as kings David and Solomon, the birth of Christ, the flight to Egypt, some deeds and the Passion of Christ. The story stops rather abruptly with the crown of thorns and fails to illustrate the crucifixion, and more importantly, the resurrection. In contrast, the journey of the Three Kings is covered extensively in 15 individual panels with presentation of the gifts, in two panels, almost an afterthought. This emphasis on traveling probably reflects Zillis position on the important, if difficult, Via Mala and San Bernardino crossing of the Alps to Italy. The painting of St Christopher, the patron saint of travelers, is similarly a confirmation that traders passed through here on arduous and dangerous journeys. The final row at the back of the church deals with St Martin of Tours, the patron saint of the church and village amongst others. It includes famous scenes from his life including Martin cutting his cloak in two to share with a shivering beggar and where he saw through the devil’s attempt to present himself as Christ. St Martin of Tours was chosen as the royal patron saint by the Merovingian King Clovis (481-514) and the tradition continued with the later Frankish and French kings. As a result, St Martin is still widely venerated in France, Germany and many other parts of Europe. 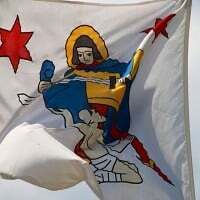 Note the local town flag: it features St Martin slicing his cloak in two to share with a shivering beggar. The two red stars are for Zillis and Reischen – the two villages that united into a single commune in 1875 – current population around 400. Below the ceiling, the upper parts of the nave walls are painted with a geometrical frieze. 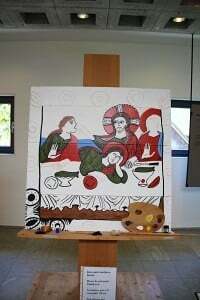 These pattern and colors resemble those find in other early Christian churches such as in Ravenna (Italy), Müstair (Switzerland) and also repeated in the historicist mosaics in the Imperial Cathedral in Aachen (Germany). It is well worth first seeing the small exhibition (Ausstellung) on the creation of the ceiling before viewing the actual art in the church. The exhibition is in a modern building in the main road of the village – signposting is clear from and to the church. Most of the information in the exhibition is in German only but the short video presentation can be heard in English and most of the rest of the displays can then easily be followed. The video explains the medieval views of the world and how the ceiling themes and layout can be understood. It also explains briefly the life and myths surrounding St Martin. However, most relevantly, it explains how the ceiling was painted. The wooden panels – most pinewood – were whitewashed. The outlines were drawn, the colors filled in and the final black detailing painted in. The panels were painted – probably by miniatures painters with book illustrating experience – vertically and then installed in the ceiling. This is not Michelangelo painting the Sistine Chapel on his back – Zillis was rich from trade but hardly a cultural powerhouse on par with Hildesheim or even large monasteries in the region such as St Gallen or Reichenau. The exhibition center also has many items that may be touched and turned. Many of these keep children busy but it also gives visitors the opportunity to compare isolated parts of different paintings such as only the heads, feet or specific symbols. A multimedia presentation is available in English too. It explains the individual paintings, as well as the cycles inside the larger ensemble. Pick a few favorites and try finding them again inside the church. 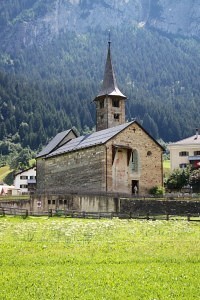 The St Martin’s Kirche in Zillis is open daily from 9 am to 5 pm (closing at 6 pm from April to October). The exhibition (Ausstellung) is only open from April to October from 9 am to 6 pm). Tickets are CHF5 and give admission to both the church and the exhibition. It is sensible to see the exhibition first. Zillis can easily be reached by car or on the Swiss postal bus service. Zillis is on the route between Chur and Bellinzona via the San Bernardino Pass (Little San Bernard) and the Via Mala. This arduous journey via the valley of the Hinterrhein (Posterior Rhine) was long closed in winter but the San Bernardino tunnel now allows year round travel on the Autoroute A13, as a sensible alternative to the better-known St Gothard tunnel. If arriving by car, leave the autobahn A13 (E43) at the Zillis-Reischen exit. Close to Zillis town “Zur Kirche” and parking signs led visitors to the free parking lot just below the Kirche St Martin. Postal buses offer the only public transportation option to Zillis – use the stop Zillis, Posta. Buses are fairly frequent with some making the full journey from Chur to Bellinzona – a beautiful ride. Bus traveling times from Chur are 37 minutes to Zillis and from Bellinzona 1h30. Most buses make shorter journeys. The most useful for many would be the 10 to 15 minute journey to Thusis Bahnhof, the northern station on the UNESCO World Cultural Heritage listed Albuna-Bernina rail network (Rhaetische Bahn and Bernina Express) with connections to Chur, St Moritz, and elsewhere in Graubünden. This bus connection is generally available at least hourly. Some buses require reservations. If space is available, a reservation can be made when boarding – the only annoying bit is that it adds a reservation fee to the ticket price, which is fine when crossing the Alps but a bit pricy if only going to Thusis. Reichenau Island in Germany with three Romanesque churches and lovely Romanesque wall paintings. The Monastery of St Müstair in Graubünden with the best-preserved Carolingian wall paintings, and some Romanesque frescoes, in Switzerland. The Monastery of St Gallen – a long history but now mostly visited for its magnificent Baroque library. More photos of Zillis on Flickr.